Its Day Eight of OSR Christmas. Before we get to today's festivities, let's find out who is the recipient of yesterday's awesome gift who ARE the recipients of yesterday's recent GIFTS, as +Jason Paul McCartan offered to make one gift into three! Bob Brinkman, dogrodeo and Dave Bendit - congrats. Email me at tenkarsDOTtavern and we'll get you hooked up. So glad this has been immortalized in digital form. I've never seen the white box materials, so I'd love to pick this up. Hoping they add this to the PoD list soon. I play a lot of Swords & Wizardry Complete, so I'd love to see the original version of the rules! My precioussss I wantssss it. A treasure I hope they make available POD at some point. Earliest edition I ever owned was the Moldvay Basic (with the Erol Otus cover). It'd be fun to read through the White Box. YUS! This would be awesome. Congrats to the previous winners. I am hoping to win something this year! 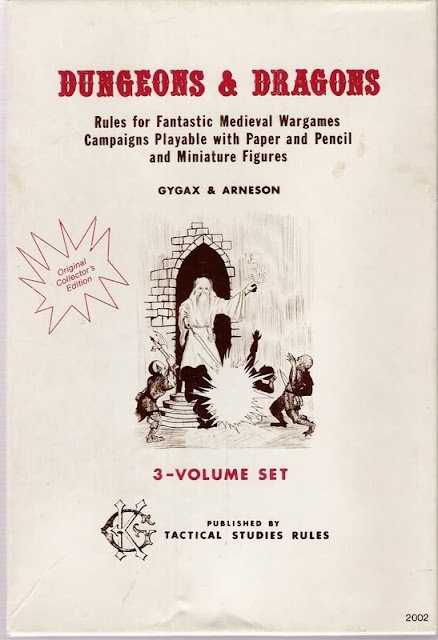 I've heard the White Box D&D books are kind unintelligible, but I'd love to have PDF copies of them all the same! Awesome, good 12 days of OSR Christmas so far. I've never actually seen this let alone read the rules. I'm dreaming of a White Box Christmas. I'm onboard for this one. I do not have this in print or digital. What a treat this would be. Deal me in. The ur-text of roleplaying: hell yes. Looking into what started it all. I'm surely interested. I would love to have this. Thank you! I haven't seen these rules since 1979, the first time I played something called Dungeons and Dragons. Woohoo! I think I emailed you Erik - I'm assuming you're on gmail. Never read these, would love to. Would love to read these as well. Um, yeah, this looks awesome! I need those in PDF. Sadly I always thought the Blue cover D&D book was the first game. I had the set basic red and expert blue set with the holes punched in them. I did not realize this existed until about 2 years ago when I started following the OSR movement. This is in print? Didn't see that anywhere. Heh. D&D and I were born the same year. Could we have been switched at birth? Whoa! Thank you and Merry Christmas! I'm down for this too. Picked up two of the three books ages ago. Went by the same store a few weeks later, and they had a white box, but I had to wait till payday to grab it. Showed up on payday, cash in hand. I think I rolled another 18. Old Dragons are best dragons! In for the original game! I'd love to read the original rules. This one has been in my wishlist for some time now. it would be fantastic to get this set and just explore what the origins of the hobby is and see what we can learn from playing through the system again.